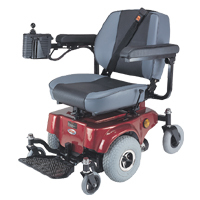 The HS 2800 Mini Electric Wheelchair offer superior power in a small package. The HS 2800 will maneuver in the tightest spaces, yet is powerful enough to carry 300 lbs. The armrests flip up and back, so that the HS 2800 will easily fit at the dinner table. The seat is a comfortable, contoured padded mid back design that also swivels. 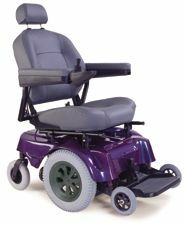 The flip up footplate is standard, however elevating leg rests can be added as an option. Mid wheel drive offers great maneuverability. Two-motor mid-wheel drive design provides outstanding maneuverability. 10" knobby drive wheels and optimum weight distribution offer superior traction.